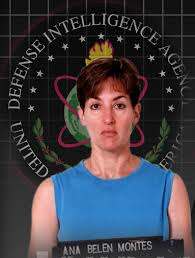 For sixteen years Ana Belen Montes spied for Cuba from increasingly responsible positions at the Defense Intelligence Agency. If Havana has ever run a higher level or more valuable agent inside the American defense establishment that has never been revealed. When she was arrested in late September 2001, Montes was about the equivalent in rank to a colonel. She had access to sensitive compartmented intelligence. Strangely, for one so openly enamored of Fidel Castro, her superiors considered her one of the best Cuba analysts anywhere in government. Thanks to researcher Jeffrey Richelson and the National Security Archive new light has finally been shed on the Montes case. Because of their efforts, a 180 page study completed by the Department of Defense Inspector General in 2005 has recently been declassified. It is heavily redacted; many pages–including the CIA’s extensive comments—blacked out. Yet, a quantity of surprising new details are now on the public record. She “unhesitatingly agreed” to work with them and to travel to Cuba clandestinely as soon as possible. The following March she went there via Spain and Czechoslovakia. The Pentagon report does not state the obvious: while there she must have received specialized training in intelligence tradecraft. Then, with Cuban encouragement, she applied for a job at DIA. A standard background investigation was conducted, but we now know that serious concerns about her suitability were raised. Without elaboration, the Pentagon report indicates that they included “falsification of her Master of Arts degree from Johns Hopkins (University) and her trustworthiness.” DIA did not require applicants to submit to a pre-employment polygraph exam. So, a trained Cuban espionage agent with a problematic past was cleared and hired. She began work in September 1985. After her arrest Montes insisted that she did not work for Cuba, but with Cuban officials she enormously respected. They felt “mutual respect and understanding;” they “were comrades in the struggle.” She believed that the Castro government “does not hurt people” and that she had the “moral right” to provide information to Cuba. Her handlers apparently were skilled in manipulating and controlling her. She said they were “thoughtful, sensitive to her needs, very good to me.” They went to “special lengths to assure her they had complete confidence in her.” They allowed her a long, loose leash, easier because they were not paying for her extraordinary services. Brazenly, she submitted a freedom of information request for her own government records. She must have been concerned that something adverse had been discovered. Investigative material was released, going back to her previous employment at the Department of Justice. She gave the surprised Cubans copies of the released documents. None of this seems to have contributed to her eventual unmasking. But how was she discovered? Surprisingly revealing information seeps through the Pentagon’s report. “We got lucky,” a counterintelligence official observed. An entirely blacked-out section entitled “Serendipity” suggests the same. By April 1998 a coordinated search for a Cuban spy was underway, according to the report. At first it was thought most likely the quarry was a CIA employee. But soon investigators were following a crucial clue: the unknown spy had apparently traveled to the Guantanamo naval base. The breakthrough had seemingly come earlier, however. According to the Pentagon report, Montes was informed shortly after her arrest that investigators “had information from a senior official in the Cuban intelligence service concerning a Cuban penetration agent that implicated Montes.” It seems that this information propelled the investigation that resulted in Montes’s arrest and incarceration. Was this judgment the result of careless drafting and editing? Or did government censors let a critical bit of information slip through? If there was evidence of a larger Cuban spy apparatus operating at that time it may be a long time before more is known. It is clear now, however, that Montes’s apprehension was not just the result of excellent intelligence work. American prosecutors were lucky. She told investigators after her arrest that a week earlier she had learned that she was under surveillance. She could have decided then to flee to Cuba, but said delphically that “she couldn’t give up on the people (she) was helping.” She is serving a 25 year prison sentence. Ana Montes won’t quite serve the 25-year sentence. She is now at Carswell Federal Medical Center in Fort Worth, Texas, and is scheduled for release on July 1, 2023, at the age of 66. She will then be able to collect her Social Security benefits from her work for the government. Since she’s never been married, she just might find a husband then. On June 28, 2000 there was a full-page and privately paid ($15,000.00), newspaper article published in the Washington Times. The privately written and paid newspaper article must have seemed so good and substantively relevant to the newspapaer´s editorial staff, it was actually published in a key position in the newspaper (for everyone to review) on the opposite page where the President´s agenda for that day appeared within the political section of the newspaper. The article spoke about those things everybody now, fourteen years later, is talking about and discussing regarding the major risk the country of Cuba has always been to the national security of the United States for the past half century and the Ana Belen Montes negative influence to the same national security policy of the U.S. toward Cuba. Meanwhile, at the same time, Ana Belén Montes then in all her “on-the-surface-glory” working at the deepest levels of the most sensitive vowels of U.S. Intelligence, she formulated the position on behalf of the United States, as a United States Intelligence officer with direct responsibilty to formulating the U.S. intelligence policy toward Cuba, and wherein such report–written by her–declared and concluded that Cuba was no longer a risk and did not represented a risk for the United States. The private writer´s article published was in fact, unbeknowngst to him, as a writer, that his article became Ana Belen Montes´ achilles heel. The privately paid and written article–motivated by the writer´s patriotism to this country—became her anti-thesis, because the article singularly and publicly declared Cuba was a tremendous risk and it stated the U.S. Intelligence community was aware of such fact; that Cuba was a tremendous risk to the national security of the United States at a time when Ana Belén Montes was reporting the opposite conclusion that Cuba was no longer a risk to the National Securtity of The United States. That article´s content was enough to put the spotlight on Ana Belén Montes right in the heart of Washington DC where the article was also published. Ana Belén Montes not having yet been discovered–in the least–after reading the article jump-started what became a federal investigation against the writer–a private citizen–who owned a vocational technical school in Puerto Rico and who was adamant about the fact the President of the United States and the White House had done nothing, at all, to resume “air-land-and-sea” military training in the island of Vieques. Meanwhile, at the same time, over 80 Puerto Rican Leftist protesters had illegally broken-into federal grounds and precluded miltary training there for a whole year without even as much as one single arrest been made. In fact, miltary training was halted and the Joint Chiefs of Staff of the United States threatened the President as Commander in Chief with resigning if military training was not resumed. In the private writer´s article, he suggested the Clinton´s needed the huge Puerto Rican vote constituency in New York for wife Hillary Clinton–the first lady–to be able to become elected a U.S. Senator for the first time and that´s why they did not want to proceed just yet–then–to deal with such Puerto Rican protesters illegaly camping-out on Military grounds precluding military training, cornerstone to U.S. National Security, while at the same time also the whole island of Puerto Rico was in an uproar on Vieques that could spill-over into the U.S. Puerto Rican population in New York City, a key factor for a decisive victory to a U.S. Senate candidacy sought by Hillary Clinton. Hillary Clinton even participated as Marshall in the Puerto Rican Day Parade, which had chosen as theme “Peace for Viques”, synonymous to halting military training there and a direct conflict with her husband´s office obligation to secure miltary training for a volunteer army, which was his first duty. That´s how Ana Belen Montes came to the surface; to entice an investigation against the writer of the newspapaer article by contacting her multiple contacts in Washington DC, at the U.S. Department fo Education to have the writer´s school investigated who had put the spotlight on her. Ana Belén Montes slipped on a “Banana Peel” unkonwingly placed by the private citizen writer of the newspaper article. That is how authorities began to take a look at her, the rest fiction. Ana Belén Montes read that article published by a concerend U.S. citizen and a patriot who had what it takes to publish his views, which turned out to be right: 1.) Cuba was a major risk to U.S. National Security. 2.) The White House had erroneously formulated the position that Cuba was no longer a risk when actually Cuba was a risk to U.S national security. 3.) Fidel Castro had over 2,000 sympathisers who protested in San Juan, Puerto Rico and were present when Justice David Souter appeared there to inaugurate a federal building recently renovated in old San Juan, sporting t-shirts which said: Universidad de La Habana. They yelled at Justice Souter: “Yankee go Home” in order to influence the Supreme Court decision to return Elian back to Cuba, at about the same time ocurring such event, which the privately written article also suggested Elian nevertheless should be sent back with his father. But the significant importance of the downtown event with the protesters there yellin “Yankee Go Home” in old San Juan, is a clear fact Fidel Castro´s grass roots manipulation is of a higher sub-rosa standard to influence U.S. National Security Poilcy sleeping in their ivory towers. The private writer was indicted under the name appearing in the newspaper article while his legal name is somewhat different as it appeared under the contract with the U.S. Department of Education. Members of the U.S. Department of Education indicated the order to cancel funding for the wrter´s vocational school came directly from Washington DC. I think this issue must be clarified, because the ineffable Dr. Latell has published some kind of special report in The Miami Herald about “new light” on the case thanks of the recently declassified 180-pages 2005 Report by the Department of Defense Inspector General. Is there something new in Latell´s approach? Better asked: Was something still hidden in the 2005 Report that had never come to light before? That’s a peculiar case of “cognitive dissonance.” Latell was also working for Castro without being aware of it. In the section entitled “Serendipity” from the National Security Archives recently released on the Ana Belén Montes affair, what content could possibly be in-there, written, that necesitated to be blacked-out? Was it that Ana Belén Montes became greatly pissed-off, and also her cuban intelligence handlers became enraged after June 28, 2000 when a full-page newspaper article appeared, which was privately funded and published in the Washington Times, written by a single private citizen who wrote taking the position that Cuba–had been–and still continued to be a great risk factor to the national security of the United States for many decades past and present? What this private citizen published prominently in the content of his full-page newspaper article, in the Washington Times, was actually opposite and extremely adverse to the premeditated and misguided, false and covertly formulated conclusion (in treason), which Ana Belén Montes at about that same time was providing the Intelligence aparatus in the U.S., including the White House, yet, while she worked as a spy for Cuba while working inside the Pentagon in the U.S. Defense Department and precisely charged with formulating the intelligence policy of the U.S. toward Cuba. Therefore, the newspaper article´s content represented a great danger to Ana Belén Montes, because it was opposite to all her good work as a spy for Cuba, particularly, after she had convinced her superiors in the intelligence laberynth that Cuba was no longer a threat to the national security of the United States. This private citizen who had now published and proved in his newspaper´s article´s content how Cuba was actually a great risk factor to the national security of the United States immediately represented a great potential threat to her Spy cover. Anyone in the intelligence community reading the newspaper article could have started to have questioned, even doubted, Ana Belén Montes´ recommendations where she had been falsely telling everyone that Cuba was no longer a risk factor to U.S. national security, which just on the sheer basis of her covert existence, was enough to know Cuba is in fact a great risk factor to U.S. national security. Is that, then, how she inadvertently came to the surface; to plot an illegal investigation–at the urgent behest of her cuban intelligence handlers–against this private citizen who was now greatly undermining her willful and wantom actions against the national security of the United States. This huge and extensive full-page newspaper article that came from nowhere (from no institution, no government authority) just ignited by the spirit of patriotism of a sole private citizen who published a full page newspaper article right in Washington DC, while stating Cuba was a major risk factor to U.S. national security. Is this the “serendipity”, is this the “we got lucky” factor in the National Archives recently released? Was it a private citizen who had more–obviously–more vision and and intelligence talent to know and to discover and publish, for everyone to read, what he believed; which was that Cuba was a great risk factor to U.S. national security, at a time when the whole central intelligence community of the U.S. was sleep about that fact under the covertly misguided efforts of false guidance prompted by a cuban spy named Ana Belén Montes who was also the top U.S. intelligence officer from the U.S. on Cuba. The private citizen and writer was investigated right after (just a few days after) his privately funded and written newspaper article was published letting everyone know he believed Cuba was a risk to the national security of, his country, the United States. Who would have a more vested interest to investigate this private citizen who wrote and published for everyone to read in his privately funded full page newpaper article that Cuba was a risk to U.S. National Security? Would it have been the intelligence detractors such as Ana Belén Montes and her cuban handlers? It seems this private citrizen was on the ball and right on the money to what Ana Belen Montes represented, even if he didn´t even know she existed, because truly behind the scenes Ana Belén Montes had in fact covertly misguided (and did so) the U.S. Intelligence community for a long time regarding Cuba. The private citizen was later indicted on ridiculous and unfounded reasons, his wife even arrested, all because Ana Belén Montes had great power and reputation in Washington DC circles who caused an investigation against this private citizen before she was uncovered to be a Cuban Spy on opposite sides of the spectrum to this citizen who believed and wrote that Cuba was a great risk factor for the national security of his country. A lot of so called “spy catchers” and investigators have taken credit for the demise of Ana Belén Montes, but the fact of the matter is, one sole, single private citizen put his own money and his own well being on the line for this nation and his contention that Cuba represents and is a great risk factor for the national security of the United States, which not only turned out to be true and fact, but turned-up a big catch in the persona Ana Belen Montes later, who became the largest covert infiltration of a cuban spy–or any apy from anywhere–into the U.S intelligence community of the United States. The private citizen was indicted under the exact same name he published in the newspaper article, somewhat different to his legal name as appearing in a contract of his school with the U.S. Department of Education; without the mother´s maiden last name. That is prove sufficient, alone, the private citizen was targeted from a fabricated investigation started by Ana Belén Montes to thwart his attempt to tell the U.S. Intelligence community Cuba was a risk factor, when the U.S. Intelligence community even the White House did not know better by believing a Cuban spy–Ana Belén Montes–who had infiltrated the U.S. Intelligence aparatus. The same way everyone is now pissed-off at Snowden for being a traitor and divulging sensitive confidential U.S. intelligence information belonging-to and highly sensitive to the U.S. national security–on the opposite end of the spectrum–I also don´t see anyone coming forward and thanking that private citizen for providing the U.S. very valuable intelligence information and standnig behind it by having it privately published in his privately funded Washington Times newspaper article to let U.S. Intelligence insiders on June 28, 2000–long before Ana Belén Montes began to be investigated– in Wahsihingtin DC to know Cuba was, in fact, a risk factor for the national security of the United States of America. Concomintantly an ifiltrated Cuban spy, Ana Belén Montes, was telling the opposite and was erroneously being listened-to and respected, yet, while covertly being a traitor as she turned out to be. The prefabricated investigation landed the private citizen in prison for 29 months instigated at the behest of Ana Belén Montes, before she was discovered to be a cuban spy who started a fabricated investigation against a silent patriot, who acted opposite her and Snowden. I have been looking on the National Security Archive site but cannot find a link to the 2005 DoD IG report concerning Montes. Does somebody have a link to it? It does not seem to have been released to the general public as yet. Mr Simmons,How was this woman hired by the DIA when she had a questionable background?a Simple police background last from six months to two years,I’m guessing someone dropped the ball here. in the middle east briefings,this situation should have brought the attention of her peers but for what I understand she would get even if she felt the fellow employees were doing her wrong so probably they were afraid to act.Another point I think was the false reputation created by her misguided supervisors making her look like she was a genius. 1.) Thanks to researcher Jeffrey Richelson and the National Security Archive new light has finally been shed on the Montes case. Because of their efforts, a 180 page study completed by the Department of Defense Inspector General in 2005 has recently been declassified. It is heavily redacted; many pages–including the CIA’s extensive comments—blacked out. Yet, a quantity of surprising new details are now on the public record. I don’t know how was possible for Montes to have such a good job an to escalate positions when her background was not good .She had a history of lying and during her high school and college years she used marijuana on the regular bases and lied about this fact and she also had open views of defending the Castro tyranny,views that were openly expressed by her on class debates. Perhaps her “family background” created a “subjective veil cover image”, which reflected, materialized to produce a “subjective notion of improbability” of her not ever possible to be a spy against the U.S., and least for Cuba. Let´s examine: 1.) She was an Armed Forced “brat”. 2.) Her father was a well reputed psychiatrist, whom inside the “family day-to-day structure”, Ana Belén Montes considered him to be an abusive disciplinarían, yet, was a high ranking officer of the U.S. Armed Forces. 3.) Her sibblings were “FBI agents”–and still are–and her mother whom she got very well along with; was a Puerto Rican activist who hated Cuban exiles and was grossly and publicly verbal about this fact. Who could have believed that this “military brat´s” pedigree would be a spy toward Cuba? Notwithstanding, there are many times, many external factors in political action, intelligence actions and governmental bureaucratic actions, which many times appear to act in conflict with one another while underneath they work together to protect each other. The fact is, the island of Puerto Rico is an incubator that breeds many U.S. citizens who grow-up there or who have family members that are in Puerto Rico and thus keep close tabs with “feelings and sentiments” outflowing from th island, yet, that many years later hatch to become the most anti-U.S. government and leftist U.S. citizens, U.S. politicans “money can´t buy” and who latently grind their axes against the United States based on their own growing-up feelings, sentiments and perceptions about their inward deep feeling of U.S. “colonialism of Puerto Rico”, many times, resulting in conflict with the Island´s governmental and political “insiders´” interest in the Island–ALL–who want to cut themselves a big slice of the pie–in the billions of dollars given for free to Puerto Rico every year–for the sake of “Puerto Rican Statehood” and for the sake of a “Free Associated Territory”. Both these political factions have one factor in common: to reap the U.S. federal funds bonanza in their pockets. The Independence of Puerto Rico is a long standing “subjective theme”, which in an island so small, serves to impact the latent Puerto Rican feeling of “Colonialism”. All factions of politics; 1.) the “Popular Party” (Free Associated Territory”) 2.) The New Progessive Party (Pro Puerto Rico Statehood) and 3.) The Independnt Party (susession from the U.S.) came together to express this latent feeling of citizenry colonialism impacted by U.S. presence in the island of Puerto Rico, by all parties–TOGETHER–getting activated to throw out the U.S. Armed Forces Southern Command and military training off the island of Vieques. I have often believed and am of the opinion Puerto Rican Congress persons, such as Congressman Serrano in NY often are ripe to be allies of the “Cuban Revolution” and such serves to allow these persons to quelsh their own deep-rooted, inward sentiments and feelings about their own perception that thier families have been subject to “U.S. colonialism in the Island of Puerto Rico”. The ilsand of Puerto Rico, with a much lower polutaion than the States of Louisiana receives a disproprotionate amount of federal aid and this análisis is appliable in comparison to other States in the continental U.S. Imagine Hugo Chavez of Venezuela was key note speaker at a Governor´s inauguration when Sila Naría Calderón became the first Puerto Rican female Governess of the Island. Even right now, there´s a lot going-on in the Popular Party members wanting to become more “independent” from the U.S.. Ana Belén Montes was raised in a family coming from a territory ripe for treason to the latent Puerto Rican believe of “U.S. colonialsm”, whether the family lived there or not, being Puerto Rican is a totality different patriotic feeling to being a U.S. citizen patriot and such sentiments, feelings and latent image of Puerto Rico flow outward from the island into the lives of many Puerto Rican who latently despise the U.S., although live from U.S. federal funds in great measure, yet, through ease of travel as American citizens. There are exceptions as with anything, but this is why I´m not surprised Ana Belén Montes´ personal family pedigree was both a tremendous decoy to the possibility oif her being a Cuban spy, while at the same time serving as fertile ground for Ana Belén Montes to express and to manifest her´s and her mother´s latent feeling aganist “U.S. Colonialism of Puerto Rico” and feelings against her father whom she considered to be an abusive authoritarian and dsciplinarian serving as a high ranking U.S. Armed Forces Psychiatrist. Who would have thought? Go figure out. I do understand that opinions between colleagues are different but whenever there are opinions that are conflicting with our country’s policy and those ideas are broadly generalized,concern may arise. Montes had issues with our country’s position concerning Puerto Rico and also she had issues with our country’s policy toward Castro tyranny, those ideas should have raise concerns. Montes said that the Cuban regime was not a threat to America and her ideas were believed without anyone else bothering to corroborate those statements and to search deeply in this matter.Cuba may not have an offensive capability such as those of the US,China,Russia etc.Cuba has great capabilities to insert spies in societies to create divisions in those societies and to destroy those societies from within.Cuba has capabilities to directly and indirectly misinform the populace of those countries as well as training leaders to corrupt the populace of those countries which the Cuban communist leaders are interested in.If anyone has a position as Montes and this person has a knowledge of Cuba’s espionage capabilities and she still denies this capability,questions should arise as soon as this person comes up with this statement. Montes statements regarding her father been so strict is a vague excuse,my father was very strict with me,he went as far as giving me a military haircut every Sunday and my clothes and room had to be organized to his standards and this fact don’t give me any excuse to become disaffected with society or my father when I was growing up,this is just a vague excuse.Let’s take for instance leaders coming from Cuba that supposedly are leaders of the opposition like Yoani Sanchez,she came to the US (In mi opinion sent by the Cuban government to gauge the reaction of the exile organizations with her different comments made during interviews)on those comments she openly denounce the embargo,she openly express towards the freedom of the 5 spies and the return of Gitmo to the Cuban Government.Sanchez is a speaker in our Universities and in one of those Universities she was given a position of speaker and she is in a position to influence students (I can recall which University offer her this position).The FBI weeks ago posted information in the newspaper about the Cuban Government penetrating our educational system in Universities.Many people see this woman as a legitimate dissident voice,however she has never directly stated anything openly incriminating the Cuban Government,however she carries the views of the Cuban Government.I will not be surprised if in the near future I see this woman in Florida in a college Campus indoctrinating students and dividing our society. Puerto Rico without America will starve.Tourism is not enough to support this island and in the Tobacco and Rum market there is great competition everywhere else.Cuba is bigger than Puerto Rico its economy is depending in Tobacco,Rum and Tourism and they are starving without American help. Montes lacked common sense.She only acted the way her handlers asked her to act.We must learn of our mistakes as a society and we should never make the same mistakes again.Our Agencies should excise trouble people as soon as these agencies find that their employees are going out of line to prevent future Ana Montes from seeking employment in our Agencies to betray our nation’s interests. In order to defeat our enemy,we must think the way our enemy thinks.